An enlargement without date labels is also available. This is a composite of photos taken on nineteen different dates in 2007 and 2008: October 25, 28-30, November 1-3, 11, 13, 29, December 12, 18, 25, January 2, 12, 30, February 9, 23, and March 9. 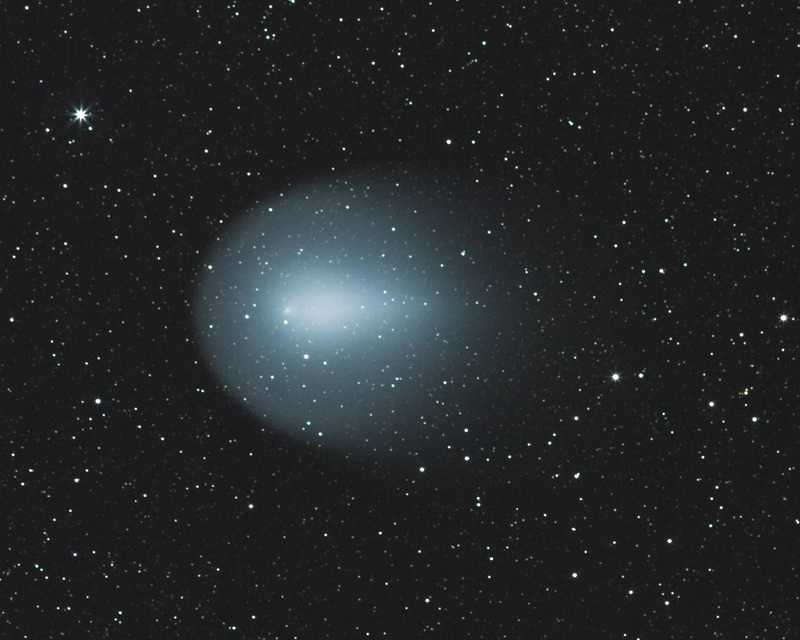 It illustrates the change in position and size of Comet Holmes over a 136-day period. 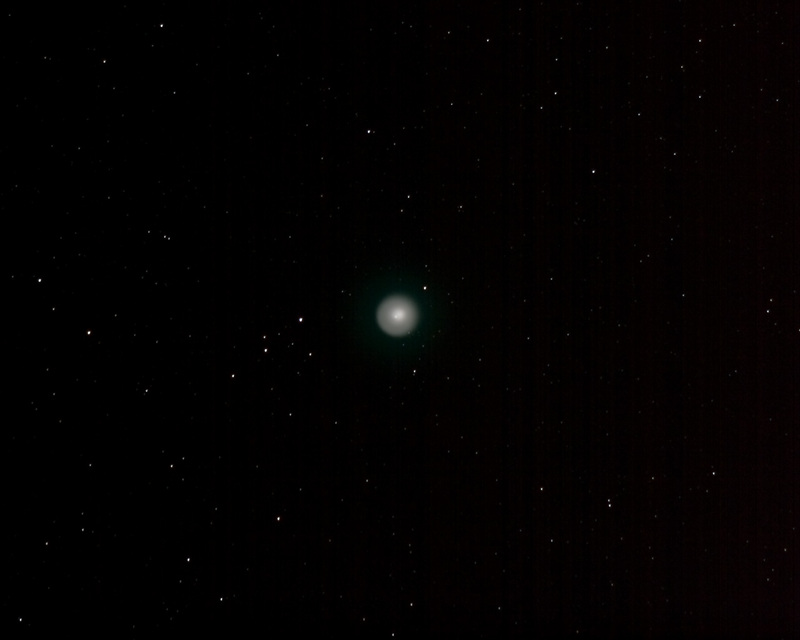 Relative brightness is not meaningful because the images were not processed consistently. The comet had an inclined elliptical orbit between the orbits of Mars and Jupiter. It's perihelion (closest approach to the sun) was on May 4, 2007. The earth "passed" it in orbit on November 5, 2007, at a distance of about 1.6 astronomical units (au). 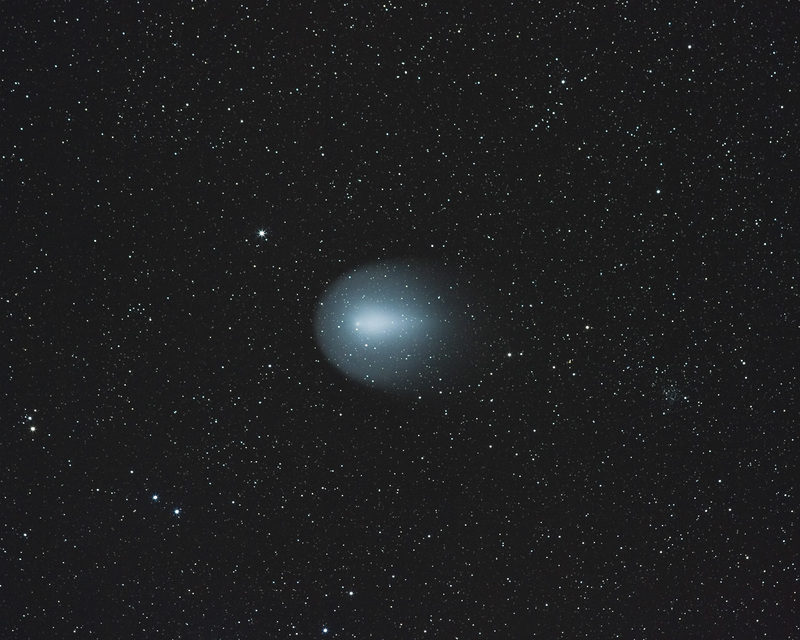 The curved path in the photo illustrates the comet's retrograde motion. By December 18 it was 1.8 au away, yet its angular size had grown to three times that of the sun or moon. 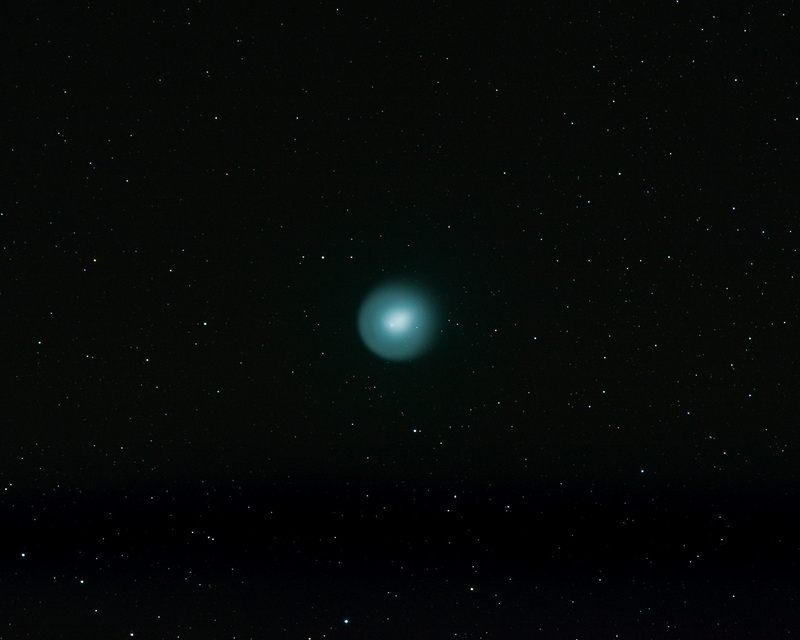 This made its real diameter on December 18 more than 7 million kilometers, five times the diameter of the sun. 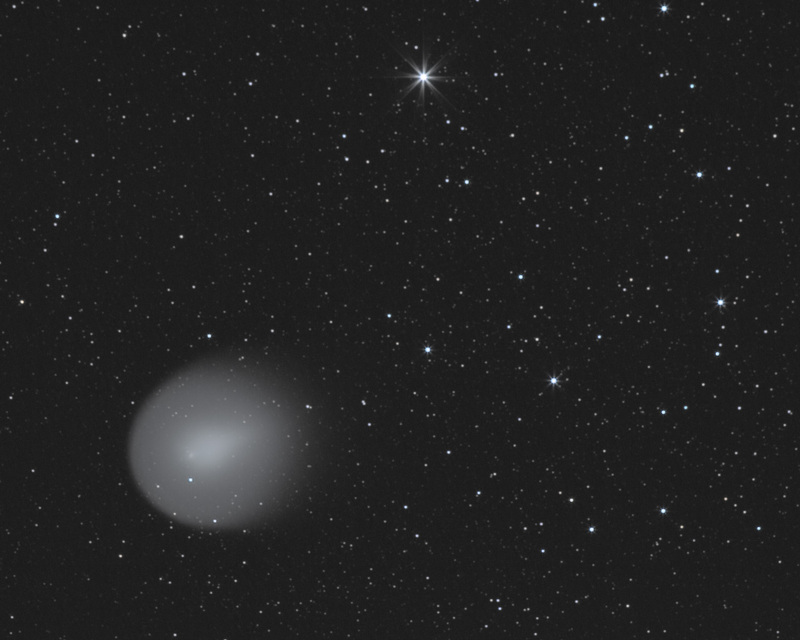 On November 5, from our perspective on Earth the comet was nearly opposite the sun. Since the tail pointed away from the sun, we were looking along its axis and unable to see it very well. 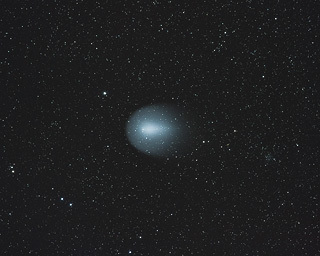 The comet appeared circular in the images taken near that date. 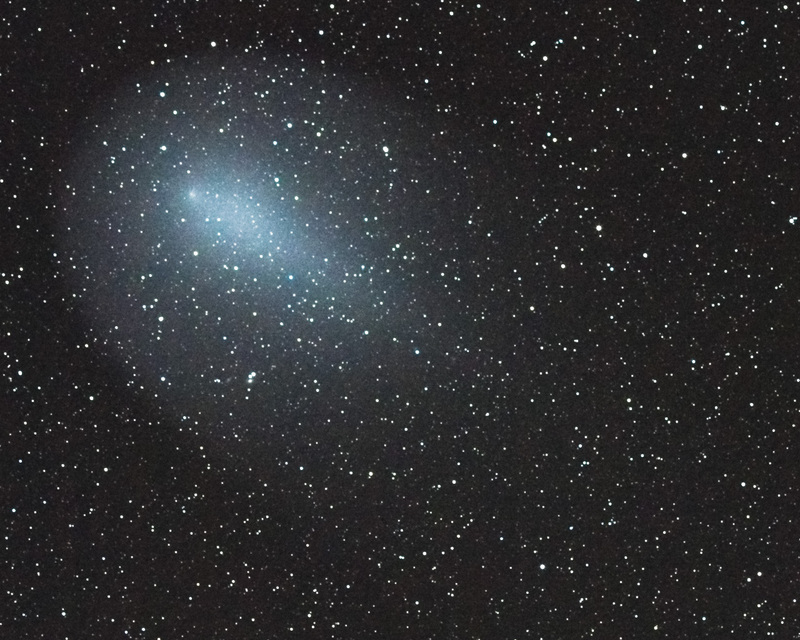 Since then, we gradually viewed the comet more from the "side," enabling us to get a better view of the tail. 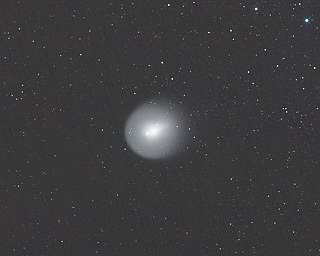 This made the comet appear more elongated in later images. Each of the individual images that went into this composite is included among those shown below, along with detailed information about the equipment and camera settings used. Each of those single-date images is an overlay of multiple exposures. In total, this composite is made up of 892 individual photographs totaling 6.1 hours of exposure. This image appears in Foundations of Astronomy, 11th Edition, by Michael A. Seeds and Dana Backman, and Horizons: Exploring the Universe, 12th Edition, by the same authors. An earlier version of the image was featured on NASA's Astronomy Picture of the Day on February 5, 2008. You can also view this series of images in context in the sky, by loading this kmz file (24 MB) into Google Earth. This photo was taken the evening of March 9, when the comet was near NGC 1499, the California Nebula. This image was cropped to frame these objects, and thus is not on the same scale as the images below. This image was assembled from 72 30-second exposures taken with a Canon 40D and 200mm lens, f/4, ISO 1600. The series of exposures began about 22:08 EDT and ended about 40 minutes later. This photo was taken the evening of February 23. Transparency was poor, light reflected from snow-covered ground caused increased light pollution, and my lens became coated with a heavy frost about 20 minutes after I began photographing the comet. The open cluster NGC 1342 is above and to the right of the comet. 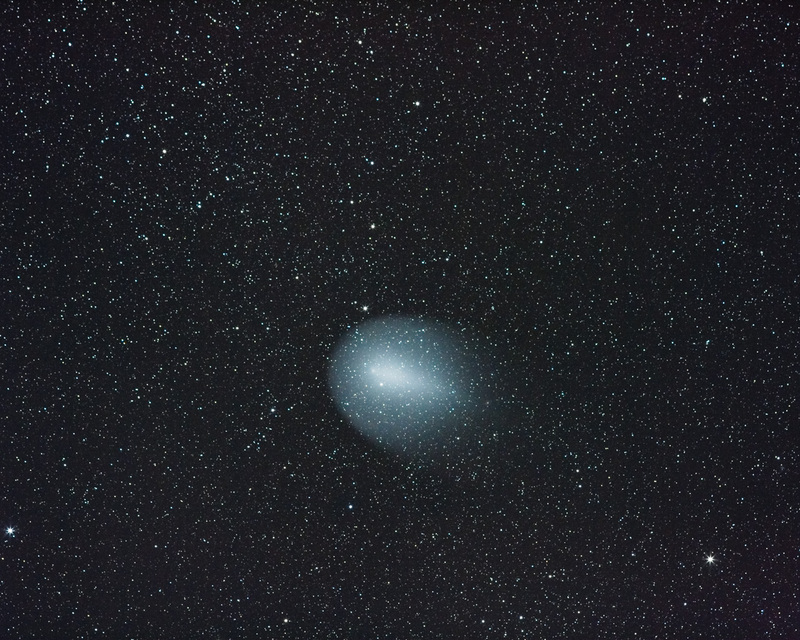 This image was assembled from 32 30-second exposures taken with a Canon 40D and 200mm lens, f/4, ISO 1600. The series of exposures began about 19:54 EST and ended 18 minutes later. 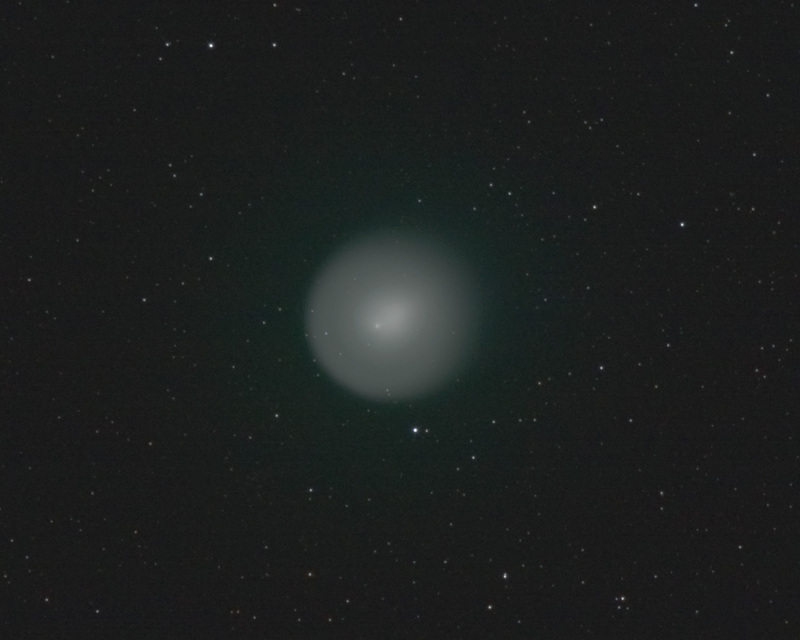 This is the same photo as above, zoomed into the comet. This photo was taken the evening of February 9. 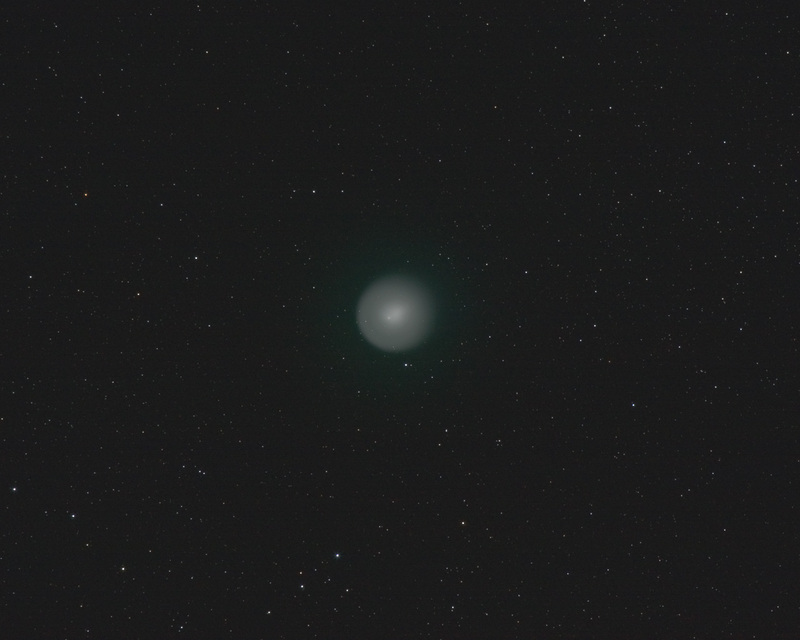 Transparency was poor, and it was difficult to coax the image of the dimming comet from the sky glow. 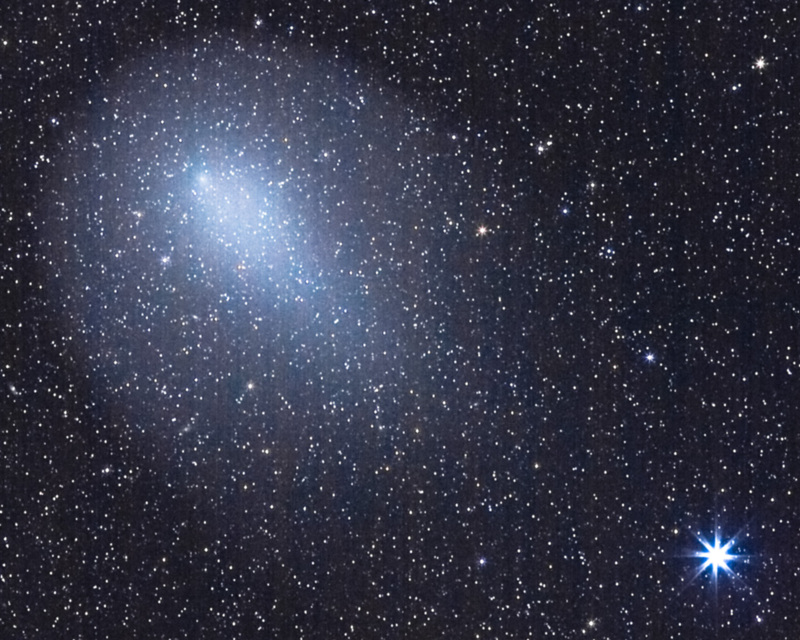 The open cluster NGC 1342 is below and to the right of the comet. This image was assembled from 50 30-second exposures taken with a Canon 40D and 200mm lens, f/4, ISO 1600. The series of exposures began about 19:57 EST and ended 32 minutes later. This photo was taken the evening of January 30. The comet has dimmed considerably, although this is not apparent when comparing the new photo to earlier photos, due to differences in processing. 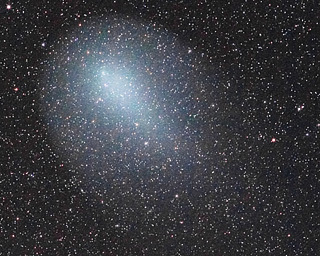 The comet still appears about 1.7 degrees long and 1.3 degrees wide. Despite the similar dimensions, both the coma and the brighter central region seem less elongated than during December and early January. 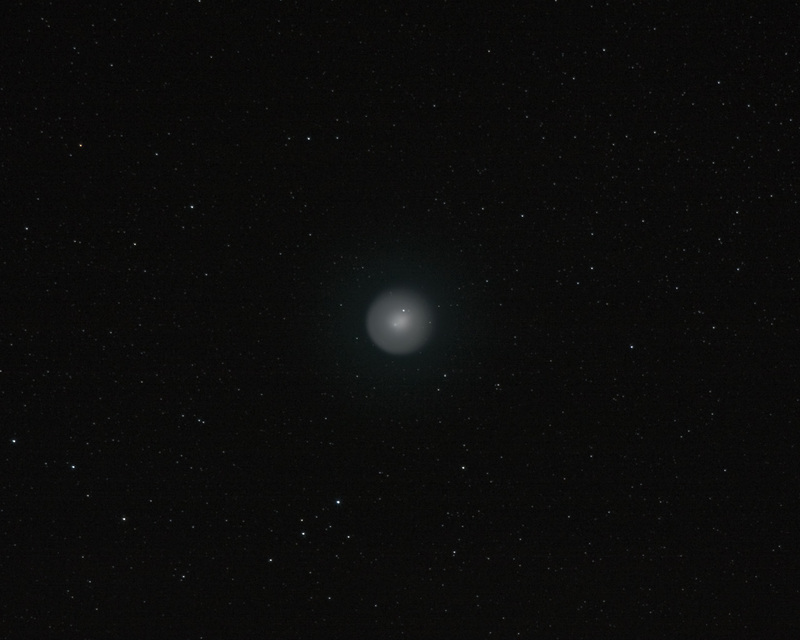 Algol is the brightest star in the image, and Omega Persei is the next-brightest. 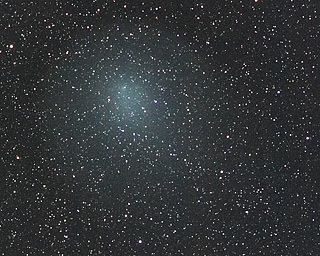 This image was assembled from 44 30-second exposures taken with a Canon 40D and 200mm lens, f/5, ISO 1600. The series of exposures began about 19:19 EST and ended 29 minutes later. This photo was taken the evening of January 12. 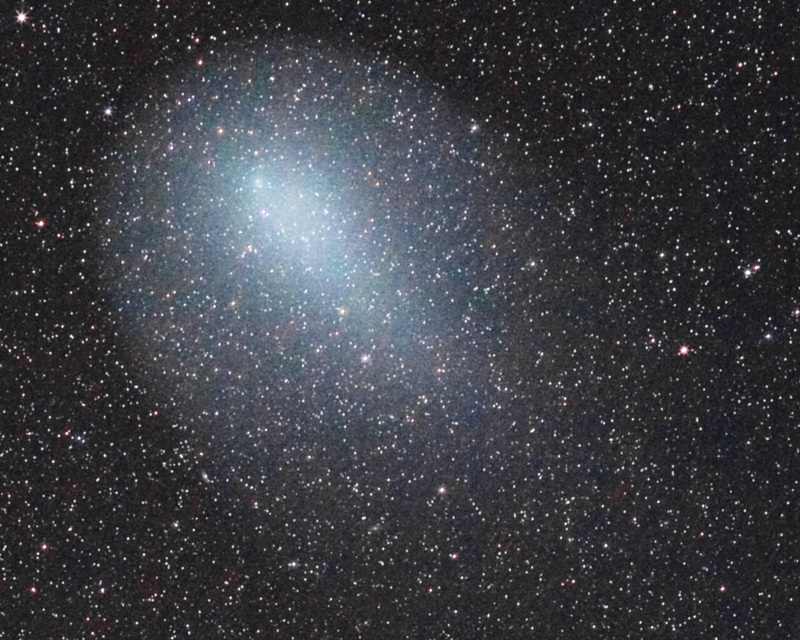 The comet now appears to be about 1.7 degrees long and 1.3 degrees wide. Algol is the brightest star in the image, below and to the right of the comet. 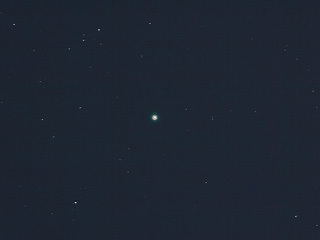 Kappa Persei is at the left edge of the photo, and Pi Persei and Omega Persei are along the right edge. This image was assembled from 88 30-second exposures taken with a Canon 40D and 200mm lens, f/5, ISO 1600. The series of exposures began about 18:54 EST and ended 89 minutes later. This photo was taken the evening of January 9. This image was assembled from 37 30-second exposures taken with a Canon 40D and 200mm lens, f/5, ISO 1600. The series of exposures began about 20:24 EST and ended 20 minutes later. This photo was taken the evening of January 2. 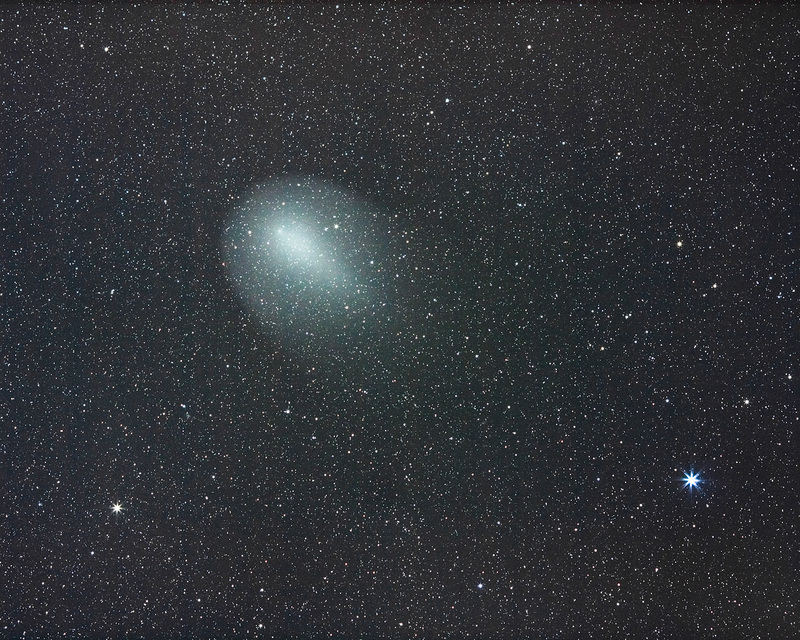 The comet now appears to be greater than 1.6 degrees long and 1.15 degrees wide. 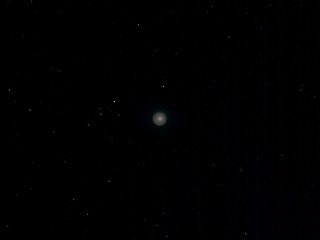 Algol is the brightest star in the image, at the lower right. 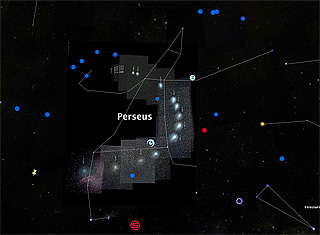 Kappa Persei is at the lower left. The comet is in a very rich region of the sky, and numerous galaxies can be identified in the photo. 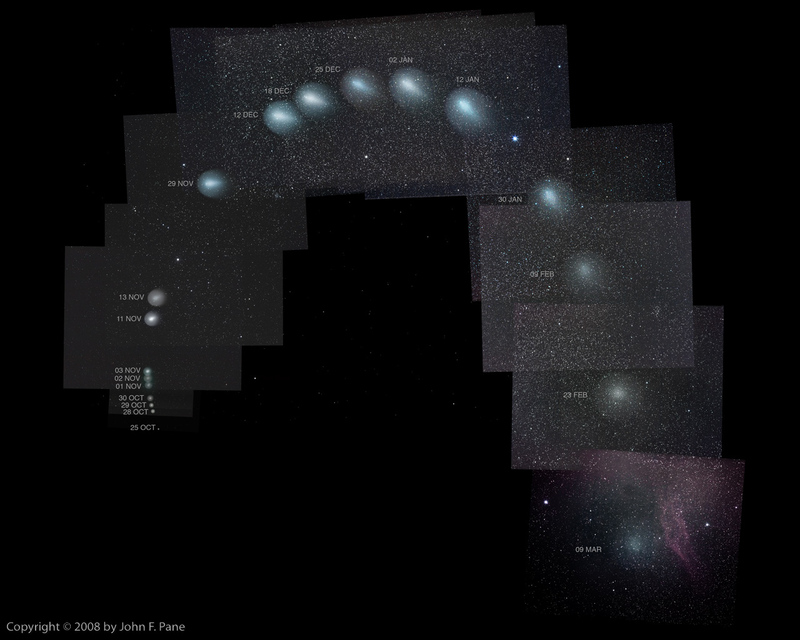 Most prominent are NGC 1171 in the lower area of the coma, NGC 1174 just beyond the coma towards Algol, NGC 1160 and NGC 1161 to the left of the pseudo-nucleus and NGC 1129 to the upper right. This image was assembled from 71 30-second exposures taken with a Canon 40D and 200mm lens, f/5, ISO 1600. The series of exposures began about 21:45 EST and ended 40 minutes later. 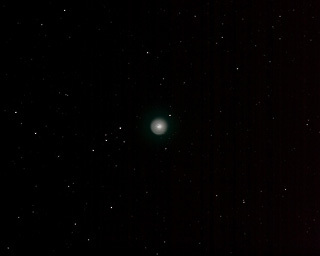 This is the same photo as above, zoomed into the comet. 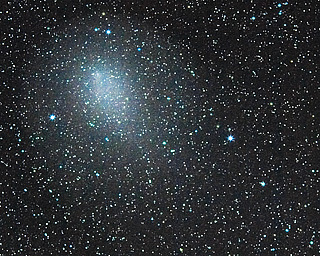 Both NGC 1171 and NGC 1174 are within this crop, near the bottom of the coma and near the lower edge of the image, respectively. This photo was taken the evening of December 25. 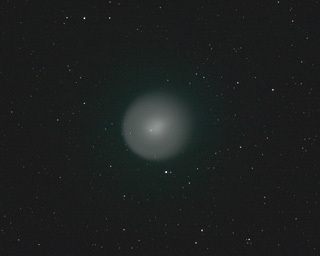 The comet continues to grow, appearing to be greater than 1.5 degrees long and one degree wide; however, it is becoming more difficult to determine its extent due to the decreasing surface brightness, and especially this night, because the sky was not completely dark due to the rising moon. 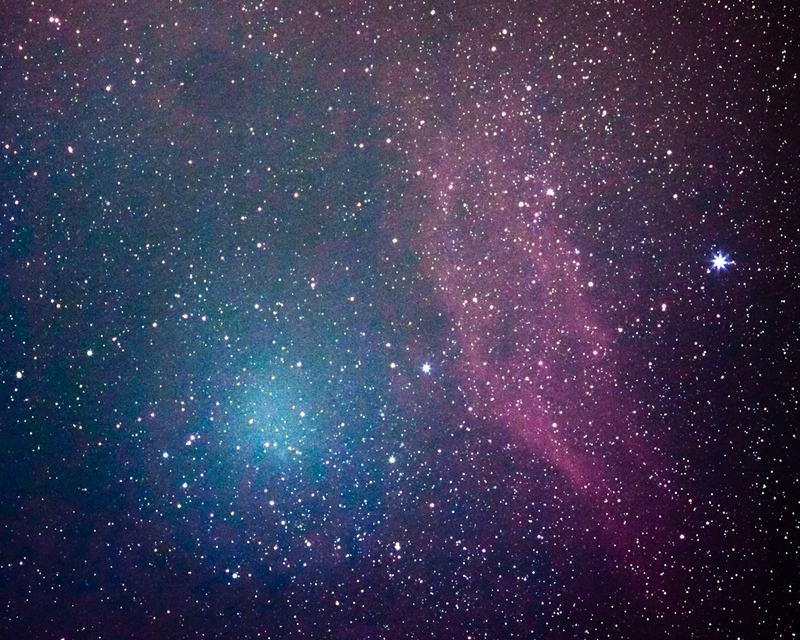 This image was assembled from 28 30-second exposures taken with a Canon 40D and 200mm lens, f/5, ISO 1600. The series of exposures began about 18:38 EST and ended 16 minutes later. Kappa Persei is the brightest star in the image, directly below the comet. 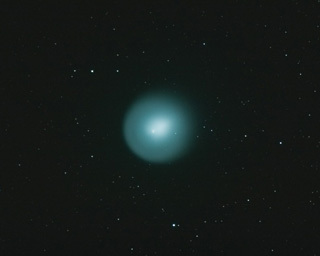 This is the same photo as above, zoomed into the comet. 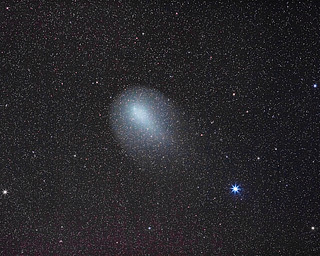 The galaxies NGC 1160 and NGC 1161 can be seen behind the coma, below and slightly to the right of the pseudo-nucleus. 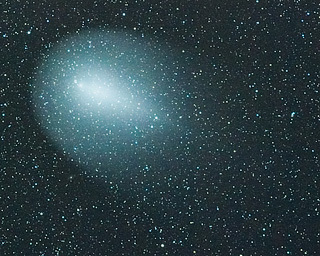 Small spikes appear to radiate asymmetrically from the pseudo-nucleus. These may be artifacts; however, if real they might indicate new outburst activity. 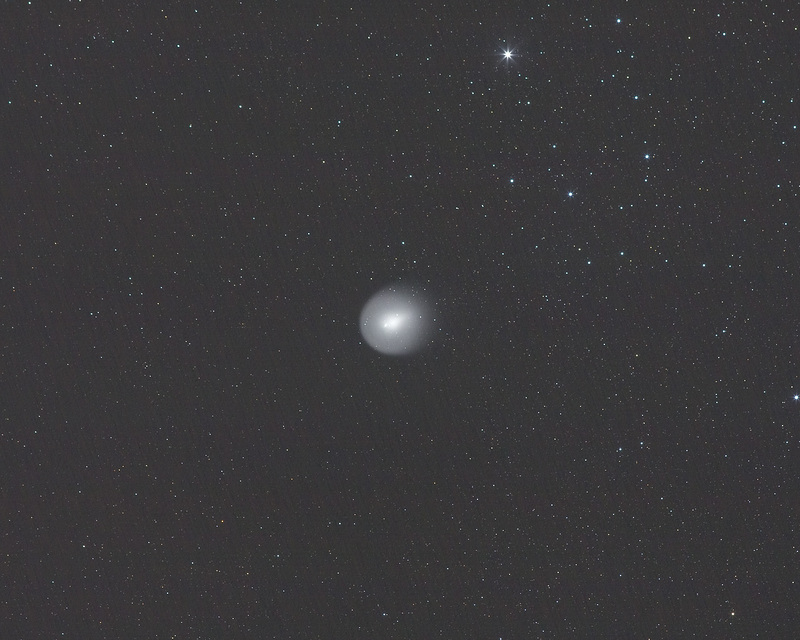 In this photo taken the morning of December 18, the comet appears at least 1.5 degrees long and one degree wide. 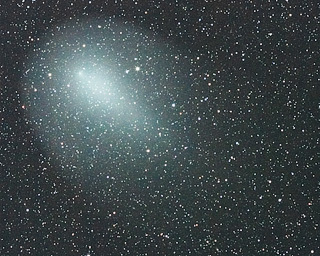 This image was assembled from 48 30-second exposures taken with a Canon 40D and 200mm lens, f/5, ISO 1600. The series of exposures began about 01:22 EST and ended 27 minutes later. Kappa Persei is the brightest star in the image, below and to the right of the comet, and the open cluster NGC 1245 is near the bottom of the frame. This is the same photo as above, zoomed into the comet. The galaxy NGC 1169 is just outside the coma, down from the nucleus. 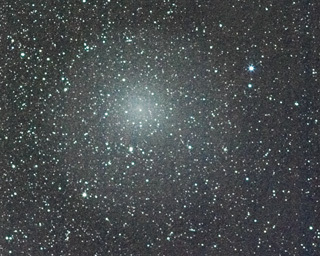 Two others, NGC 1160 and NGC 1161, can be detected near the right edge of the frame. On the evening of December 12, the coma had a diameter of more than 1.4 degrees along its longest axis, and a width of about one degree. 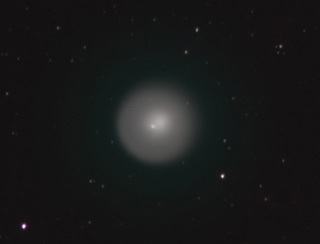 This image was assembled from 31 30-second exposures taken with a Canon 40D and 200mm lens, f/5, ISO 1600. The series of exposures began at 20:32 EST and ended 25 minutes later. Iota Persei is at the lower left edge of the photo, and Kappa Persei is at the lower right. NGC 1169, a magnitude 12.4 galaxy, can be faintly seen near the right edge of the coma. On the evening of November 29, the coma had a diameter of more than one degree along its longest axis, and a width of about 50 arcminutes. 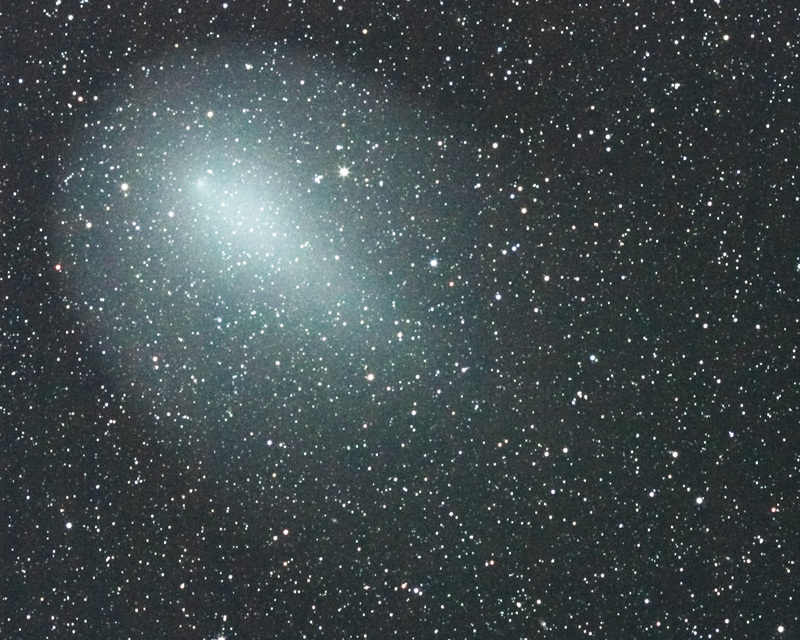 This image was assembled from 42 30-second exposures taken with a Canon 40D and 200mm lens, f/5, ISO 1600. The series of exposures began at 22:00 EST. 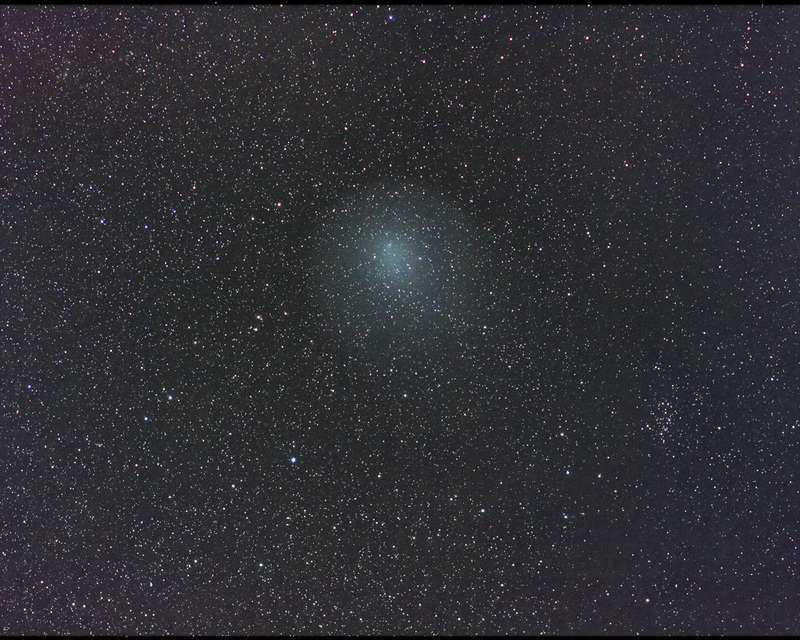 The brightest star near the comet is Iota Persei, and the open cluster NGC 1245 can be seen less than two degrees to the right of the comet. This is the same photo as above, zoomed into the comet. 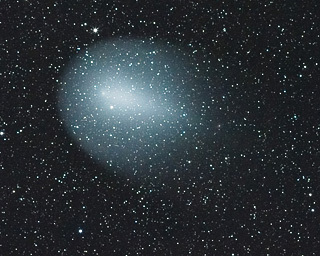 The comet is in front a rich star field, and hundreds of background stars can be seen through the coma. On the evening of November 13, the coma had a diameter of about 35 arcminutes along its longest axis, and a width of about 28 arcminutes. 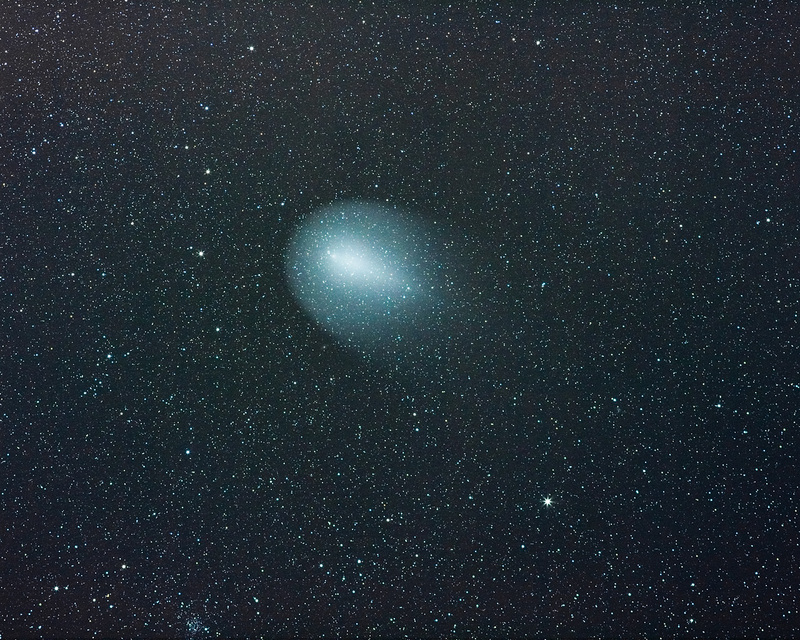 This image was assembled from 75 30-second exposures taken with a Canon 40D and 200mm lens, f/5, ISO 1600. The series of exposures began at 20:25 EST. 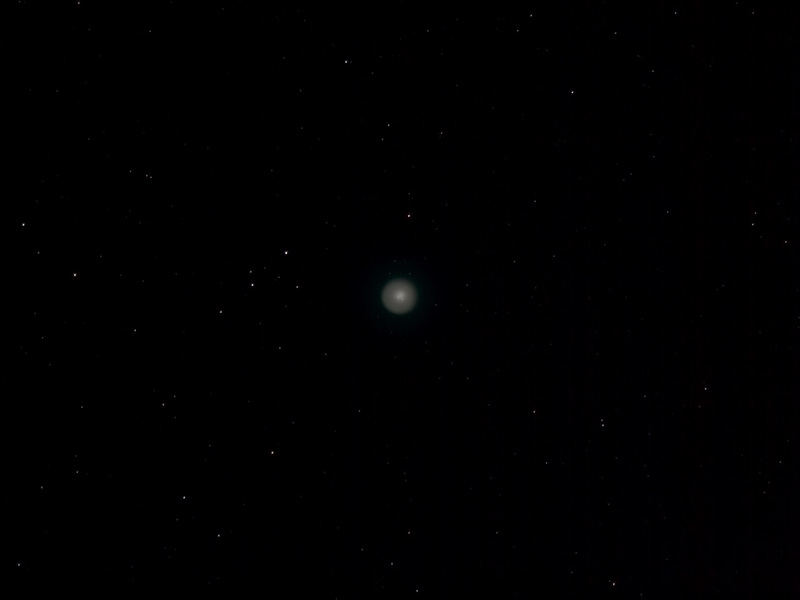 The brightest star is Mirfak. 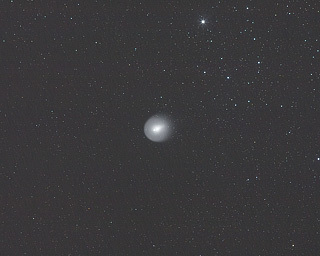 This time-lapse movie shows, over a period of about 70 minutes, the motion of the comet relative to the background stars. 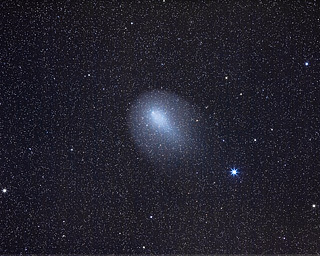 In the early morning of November 11, the coma had a diameter of about 27.3 arcminutes along its longest axis, and a width of about 25.7 arcminutes. The pseudonucleus can not be distinguished from the star HIP16642, located almost exactly at one-third the way along the long axis. 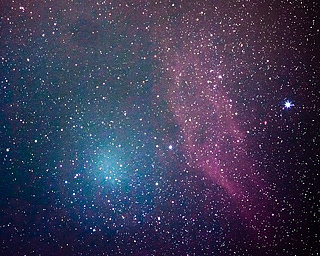 This image was assembled from 58 30-second exposures taken with a Canon 40D and 200mm lens, f/5, ISO 1600. The series of exposures began at 01:18 EST. 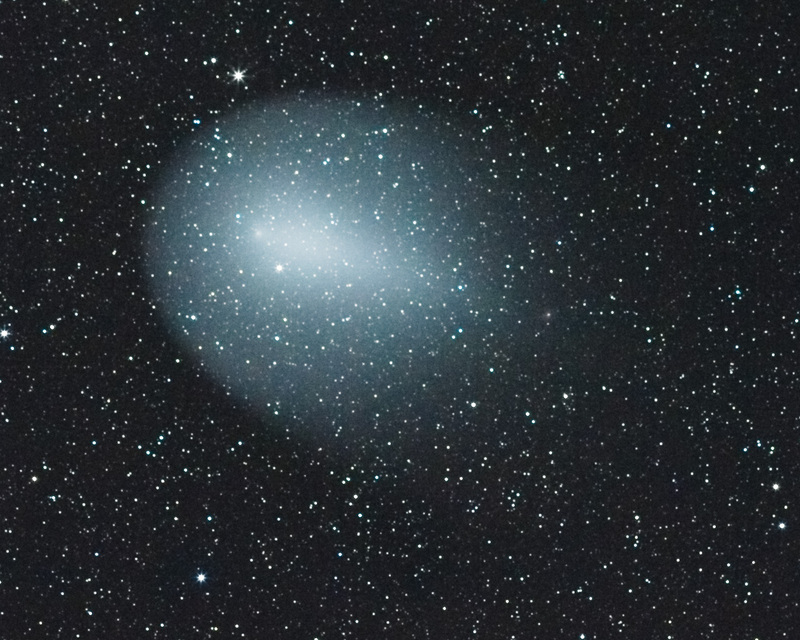 Because I did not use a teleconverter as I did on previous nights, the scale of this image, and the following detail image, are about half as large as the earlier images. On the night of November 3, the coma had a diameter of about 16.5 arcminutes. 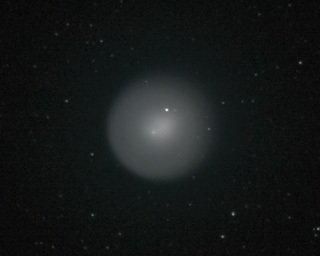 This image was assembled from 64 20-second exposures taken with a Canon 40D and 200mm lens with 2x teleconverter, f/11, ISO 1600. The series of exposures began at 22:12 EDT. On the night of November 2, the coma had grown to a diameter of about 14.5 arcminutes. Measuring the faint blue halo is more difficult, and the photo is probably not picking up all of it. However, what is visible remains about 30 arcminutes in diameter. This image was assembled from 32 15-second exposures taken with a Canon 40D and 200mm lens with 2x teleconverter, f/9, ISO 1600. The series of exposures began at 22:58 EDT. On the night of November 1, the coma had grown to a diameter of about 12 arcminutes, and the fainter blue halo about 30 arcminutes. This image was assembled from 16 15-second exposures taken with a Canon 40D and 200mm lens with 2x teleconverter, f/7.1, ISO 1600. The series of exposures began at 22:19 EDT. On the night of October 30, the coma had grown again, to a diameter of more than 9 arcminutes, and a fainter blue halo extends nearly 30 arcminutes. This image was assembled from 40 15-second exposures taken with a Canon 20D and 200mm lens with 2x teleconverter, f/7.1, ISO 800. The series of exposures began about 22:06 EDT, prior to the moon rising above my horizon. 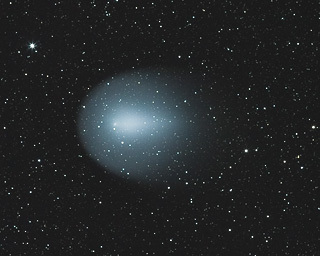 On the night of October 29, the comet had grown to a diameter of about 8 arcminutes. 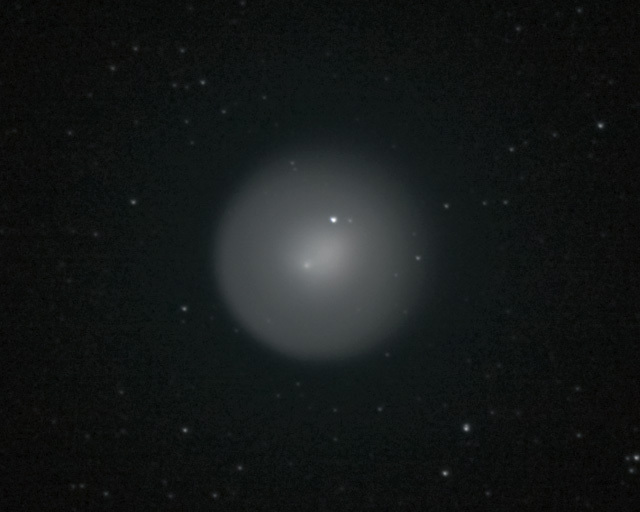 This image was assembled from 35 4-second exposures taken with a Canon 20D and 200mm lens with 2x teleconverter, f/5.6, ISO 800. The series of exposures began about 21:09 EDT, prior to the moon rising above my horizon. This photo was taken the evening of October 28. 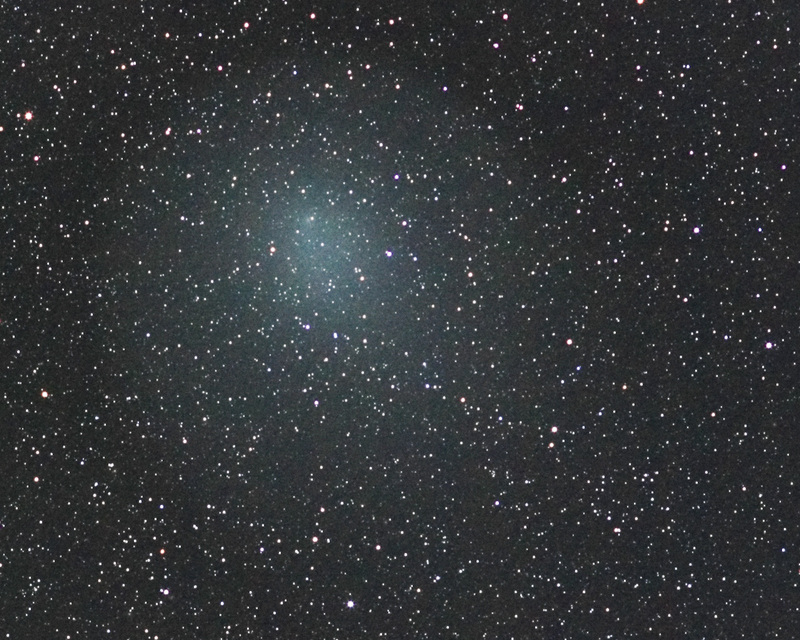 The comet had grown considerably from the last time I photographed it three days earlier, to a diameter of about 6.5 arcminutes. 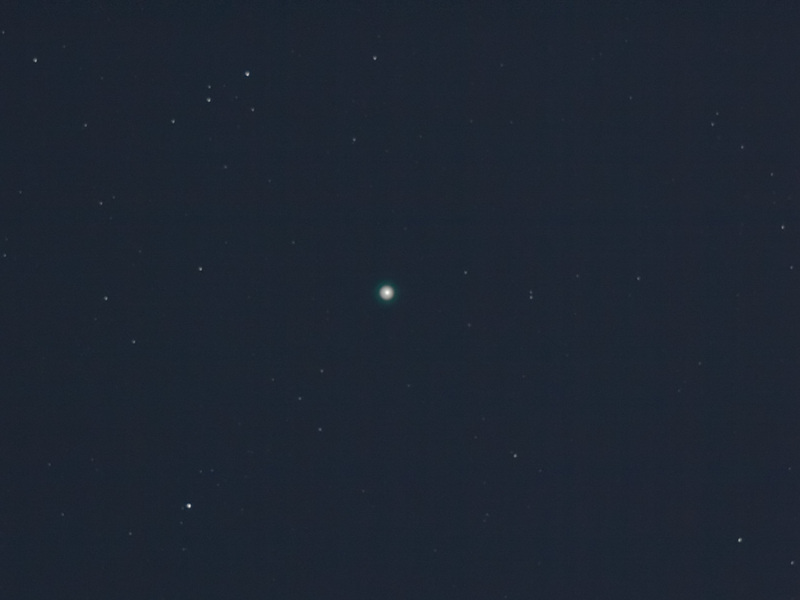 This image was assembled from 40 2-second exposures taken with a Canon 20D and 200mm lens with 2x teleconverter, f/5.6, ISO 800. The series of exposures began about 21:47 EDT with a bright moon. 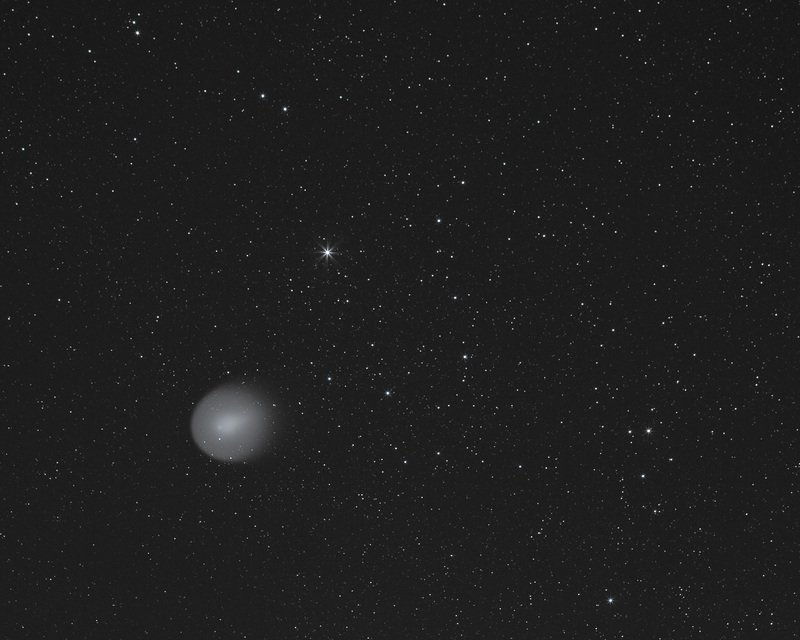 This is the first opportunity I had to view and photograph the comet after its sudden brightening on October 24. This evening the clouds broke up after about 10 PM. I quickly pulled out the camera and tripod to take some photos. 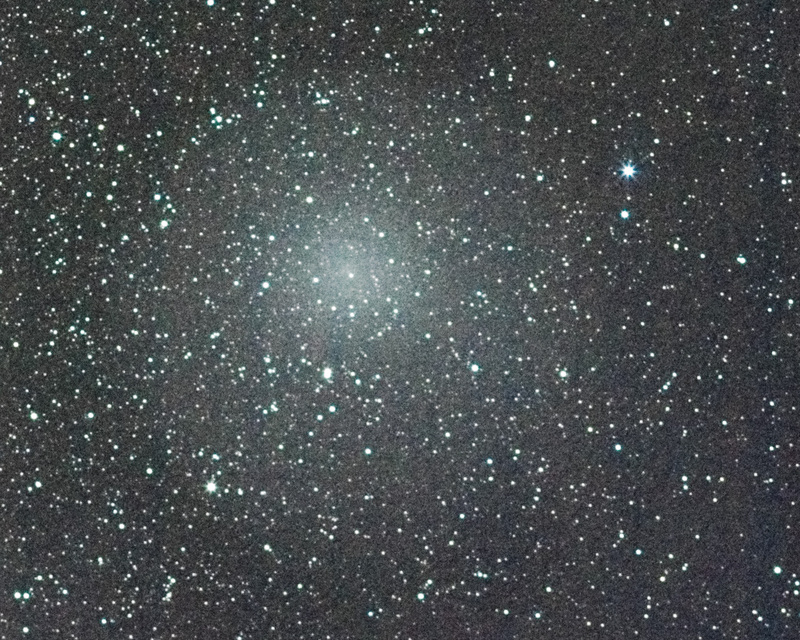 This image was assembled from 26 2-second exposures with a Canon 20D and 200mm lens with 2x teleconverter, f/5.6, ISO 800. The series of exposures began about 22:49 EDT with a bright moon. Note: this is the only image where I had the camera mounted on a simple tripod. For all of the other images, the camera was mounted on a Celstron CG-5 equatorial mount with clock drive. Additional astrophotographs of comets, meteors, auroras, lunar eclipses, etc., can be found on my home page. Clear skies!